As a masters runner for New Balance, Susan Lynne Cooke has to take care of her body more than the younger athletes. What are the keys to “staying on the road” as a masters runner? I believed that I was invincible as a runner and athlete. “No fear, no limits” was my motto when I was younger. However, I have found that this attitude doesn’t work as well as you age. 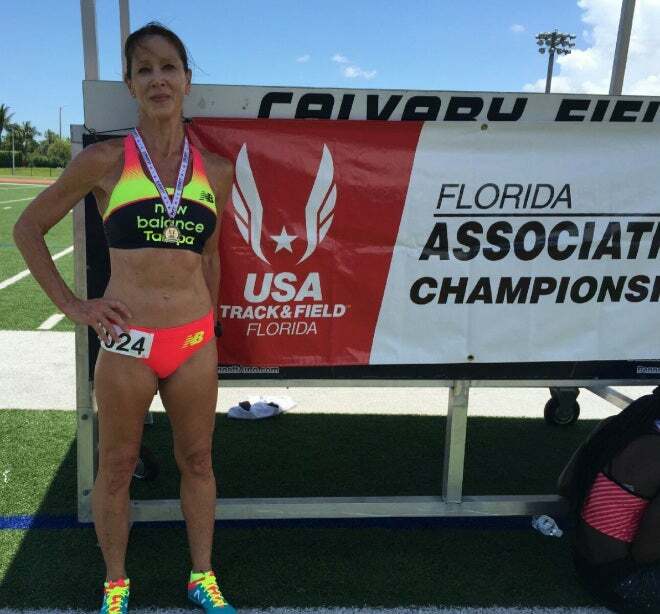 I tend to exude confidence in most things I do and love to compete as a masters runner but I have come to realize that my body has more limitations as a 57-year-old than it did as a 20-30 year old. We masters athletes do break easier. In order to stay injury-free we seem to need longer recoveries between our workouts and for the most part, shorter weekly mileage than a younger runner. Don’t feel the need to keep up with your 25-year-old niece or nephew who is training for Boston. We each have our own threshold for both acute and chronic injury and it absolutely changes as we age. Once you exceed that threshold, you get injured. One of the biggest tips in injury prevention is to know your limits. The masters runner should not do too much, too soon, too fast. There exists a 10 percent rule in training that as you start to ramp up weekly training mileage, increase it by no more than 10 percent per week—and for those that are injury prone, even less. While running as a master, it’s even more important to listen to your body. Absolutely, do not run through pain! Listen to the signals of your aches and soreness. Like with any sport, there will be some soreness, but if you have persistent pain—especially in the same location and at a certain distance—then check it out. Do not try to be tough and work through it, because you probably have an overuse injury that often will become acutely worse after a hard workout. Get a good pair of shoes that fit. Finding the right shoe for your foot type is key and consider replacing them every 500 miles. Get expert advice by going to a specialty store for running shoe guidance when you first start out. Getting the “fast bug” is something I caught early on and adding in track (speed) training will definitely help your overall performance. Be sure to limit your speed work, though. The old saying “speed kills” applies with running, too. Once a week track/speed workouts for the masters runner is usually a good rule of thumb. Any more than weekly speed workouts is usually asking for trouble and will lead to injuries, and surprisingly soon. Before you get into the meat of your run, it’s mandatory to warm up those muscles by doing a slower warm-up run for at least a mile. Adding dynamic stretching (not static stretching like we did in high school) is quite helpful in getting things ready to roll prior to a run. I have also found that cross training a powerful supplement to my running. Studies of cross training have been shown to improve muscle balance and strength, while helping you to remain injury-free. Swimming, aqua jogging, rowing, stationary cycling and even elliptical training are great ways to improve or maintain aerobic fitness while lessening the impact on the lower back, major joints, bones and hamstrings. And if you do get an injury, cross training is an essential rehabilitation tool. Finally, I would encourage you to participate in local races since they are fun, rewarding and offer a great social environment for the masters runner. There are now hundreds of races every weekend all over the country. Just don’t over-do it by over-racing. As a masters runner, you should limit your races to one per month and even less if you race longer than the 10K distance. Over-racing is a prescription for injury and your injury prevention effort should equal your exercise effort.